Cohen was married to the late Pam Brighton, the theatre director in 1970 ;their son, Ned, was born the following year. He was divorced in 1978 and married Jean McNeil, the painter in 1987. They adopted a son, Stephen, who died of an alcohol related illness in 2013 at the age of 33. This event is a central reference point in much of the creative writing Cohen has produced since then. He has four grandchildren. 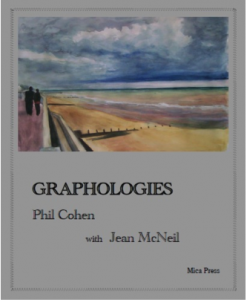 Phil Cohen was born in 1943 into a medical family living in Bloomsbury, Central London. He was evacuated to his grandmother in South Wales at the height of the V1 bombing of London, a placement which proved to be even more traumatic than Hitler’s attack on the city. He was educated at private prep schools and then St Paul’s School , where he studied classics and history , winning a scholarship to Cambridge in 1963. 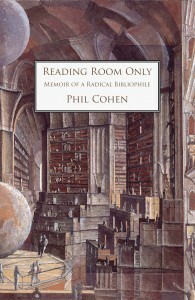 An account of early family life and schooling is included in the first part of his memoir Reading Room Only. Current Affiliations Cohen is a member of Compass , a Gramscian think tank within the Labour Party. He is on the editorial board of New Formations. In 1965 at the age of 22 Cohen dropped out of Cambridge University where he was studying anthropology and, after a period ‘on the road as a beat, and working on deep sea trawlers, became involved in the London underground counter culture scene, working as an assistant to the conceptual artist John Latham , scripting and organising ‘happenings’ with Latham and Jeff Nuttall, at Better Books, and with walk on parts at the Holy Communion Poetry Event and the Dialectics of Liberation conference. He also wrote for the underground paper International Times. For a time he was associated with the English Situationist group and its journal King Mob Echo and took an active part in several of its ‘provocations’. In 1968 he became involved in a squat at the Bell Hotel in Covent Garden out of which the street commune movement emerged. Mass squats were organised in a number of prominent public buildings in Central London , culminating in the occupation of the Queen Mother’s ex residence at 144 Piccadilly which made world headline news . As ‘Dr John the hippy squatter’ , Cohen became briefly a national folk devil, in a moral panic about the threat that squatting posed to home ownership and private property. Following the closing down of the street commune squats, Cohen worked as a detached youth worker for the Soho Project and then set up Street Aid , as a self help organisation for homeless young people in Central London , based initially in Soho and then Covent Garden. In 1975/6 , with a group of fellow Leftists including David Robins, Cohen occupied a derelict pub near Kinds Cross and turned it into a radical cultural and education centre for local estate youth. The pub was burned down in mysterious circumstances . Knuckle Sandwich :growing up in the working class city (1978), written by Cohen and Robins gives a blow by blow account of the project and situates it within an analysis of urban working class youth culture . These experiences led Cohen to develop a Gramscian perspective on post war youth subcultures in Britain spelt out in a working paper published by the Centre for Contemporary Cultural Studies (CCCS) in 197&.. ‘Working Class Community and subcultural conflict’ subsequently provided the basis for a CCCS book ‘Resistance through Rituals’ edited by Stuart Hall and Tony Jefferson . The paper has since been translated into eight European languages and become something of a classic. In this text Cohen develops the notion of youth cultures as collective responses to structural shifts in class identity formation, creating distinct sets of imaginary class relations though specific codes of dress, behaviour , music and language. This analysis was initially applied to Mods and Skinheads, in East London and subsequently to Beats and Hippies. In later work this initial focus on the youth question broadened to include issues of inter-generational transmission, coming of age stories and life course paradigms. This period is also chronicled in the first part of ‘Reading Room Only. In 1978 Cohen joined the Sociological Research Unit run by Basil Bernstein and M.F.D. Young , carrying out two research projects funded by the Leverhulme Trust into youth cultures and changing school transitions. This led to a series of publications challenging the ‘new vocationalism ‘ and the youth training schemes then being introduced by the Tory government under Margaret Thatcher with the aim of inculcating the values of ‘enterprise culture’. Playgrounds of Prejudice , an ethnographic study of playground cultures in Dockland schools This was supported by a film of the same title analysing a playground fight between an Irish and Black Boy. Empires of the Mind , a film produced by the Open University for the course on ‘Race, Culture, Difference’. This teaching material was supported by a number of theoretical texts ,including chapters in the OU course reader, and in the Blackwell Reader in Race and Ethnic Relations . During this period Cohen co-edited with Angela McRobbie the Youth Questions series for Macmillan. His own books published in the series included Multi-Racist Britain (1994) and Rethinking the Youth Question education, labour and cultural studies (1997) , which brought together all his academic research on youth culture and schooling. Cohen moved to the University of East London (UEL) in 1992 to set up and direct the Centre for New Ethnicities Research (CNER). The centre embarked on an ambitious programme of research and community engagement in East London around issues of race , racism and cultural identity. This included ethnographic studies of frontline situations of racial conflict in East London, a funded research programme on young people’s perceptions of class, gender and ethnicity in two areas of London and Hamburg whose results were published as Finding the Way Home (V&R Press Hamburg 2004). In addition the Centre organised a major conference Front Lines, Backyards (1998) curated Rich Mix, an exhibition of multicultural art in Tower Hamlets 2001), ran an extensive programme of seminars and public lectures and published a series of working papers. Some of this material was collected in New Ethnicities, Old Racisms (ed Cohen 2001). The Centre’s work was influential , especially in directing attention to the deeper , more unconscious, reaches of the popular racist imaginary. However the use of psychoanalytic and anthropological concepts to understand the interplay of myth , ritual and phantasy in the construction of common sense racist narratives, was controversial, especially amongst a section of the hard Marxist Left who held to a false consciousness model, a whole issue of Race and Class being devoted to attacking the Centre’s work . In 2004 Cohen moved to set up and direct the London East Research Institute(LERI), with the aim of co-ordinating the university’s research on the regeneration of East London , which was gathering pace at this time and included UEL’s new campus in the Royal Docks. Initially the research concentrated on the Thames Gateway , the largest regeneration project in Europe at the time and this led to the publication of London’s Turning , a collection of studies of different aspects of the eastwards turn in London’s growth. With the announcement of London’s bid for the 2012 Olympic and the decision to locate the main venue at Stratford , East London , the focus of LERI’s work inevitably shifted to evaluating the impact on local communities. 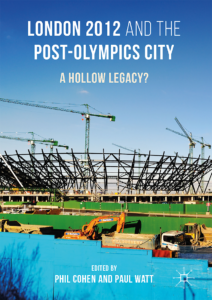 Cohen conducted an ethnographic study of the initial Dig, Design and Demolish site construction process and established ongoing focus groups with local residents and young people to chart their response to the unfolding impact of the Olympic delivery process. 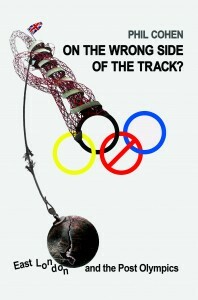 This material formed the basis of his book on the 2012 Games ‘On the Wrong Side of the Track?’ which was widely reviewed and praised : ( some quotes here from reviews) The legacy impact of 2012 was the subject of a follow up study and included in a book co-edited by Cohen with Paul Watt London 2012 and the Post Olympic City : a hollow Legacy ? (2017). Cohen’s approach to ethnography from the outset had a strong spatial as well as visual emphasis and he experimented with narrative mapping methods in research with young people around issues of public safety and danger. This interest was further developed witgh the setting up of Livingmaps ,a network of artists, activists and academics to develop the theory and practice of participatory mapping in work with communities on the front line of urban regeneration. He is the network’s research director and editor –at-large on its online journal. The network runs a programme of public events, including lectures, seminars, screenings, walks and workshops. The network also develops and delivers a variety of mapping projects in partnership with schools , community organisations and local authorities. The Groundbreakers is an audio heritage trail telling the back story of the Olympic Park , developed in partnership with the Building Exploratory , Discover, and a number of local schools with a grant from the Heritage Lottery Trust. Citizens Atlas of London is a an online platform hosting material produced by a network of citizen mappers in areas of London identified in the 2050 plan as sites of major regeneration. The project is supported by a toolkit of resources and training workshops designed to transfer knowledge and skills to build capacity in using a range of mapping methods to represent issues about the past, present and future of these ‘opportunity areas’. Cohen’s academic work is trans-disciplinary and draws on concepts from linguistics and narratology, psycho-analysis and anthropology , cultural history and social phenomenology . Early influences were Basil Bernstein’s theory of socio-linguistic codes, Gregory Bateson’s model of communication and Mikhail Bakhtin’s concept of dialogics. Latour’s actor-network theory is a more recent addition to his methodological toolkit. In his work on social and cultural imaginaries Cohen has also drawn on both the post Kleinian and Lacanian traditions in psychoanalysis , specifically the work of Michael Balint , J-P Valabrega and Guy Rosolato. Ethno-biographic codes . This is the central concept which informs Cohen’s research into the narrative templates and cultural tropes through which auto-biographies are parsed and related. Drawing on Basil Bernstein’s model of socio-linguistic codes , Bourdieu’s theory of cultural capital and its transmission and the work of the French narrative grammatologists (Bremond, Todorov ) , this framework is concerned to identify and compare the normative forms of life story telling which articulate the diachronic and synchronic orders of social reproduction. In its strongest form, each code maps out key moments and rituals of life transition, establishing gender specific markers of im/maturity, and editing structures of feeling and the syntax of experience accordingly. These grammars, when institutionalised, not only define certain developmental ideals associated with different types of social , cultural and intellectual capital, but relay the dispositions that have to be acquired to realize them. But as their normative strength weakens so their forms of articulation becomes ever more variegated, unstable and difficult to decode. Four such codes have been identified: vocation, career, inheritance and apprenticeship. Cohen’s research has investigated their origin and development in specific historical conjunctures , their forms of combination , and their contemporary transformation in familial, educational and occupational contexts. Cognate concepts are : Hidden curriculum vitae referring to the subliminal operation of the codes in structuring auto-biographical constructs and family scripts; Mimesis and Masquerade, these two fundamental orders of symbolic representation are highlighted in Cohen’s analysis of how ethno-biographic codes are disseminated , in particular through their modes of pedagogic and peer group transmission. In several studies Cohen develops a theoretical model of two contrasting cultures of modernity , each with their own distinctive chrono-topography and ideological register. In prot-modernism the past is what is left behind by the present as it progresses into the future as its open horizon of possibility. The capacity to identify and distinguish between progressive and reactionary historical forces relies on this chronotope.‘Progressive’ is is simply whatever wishes to advance towards a more just, enlightened and democratic future. For retro-modernists, modernity is not something to be aimed at or achieved but something that has never quite happened, is basically unachievable and can only be grasped as a kind of retro-fit. Here the present is experienced and narrated as a series of discrete ,discontinuous moments, belonging to an often chaotic synchronicity, split off from a past which never fades but continues to be re-presented and recycled, and from a future which is blocked, occluded, threatening or unimaginable except as catastrophe. This distinction is used to examine tensions in Left political ideology, and inter-generational shifts in youth cultural formations. The concept has been developed In Cohen’s later work around a critique of technological and environmental determinism, especially as these shape urban policy and planning. This analysis was first applied to a study of regeneration discourses linked to the 2012 Olympics and its legacy. The critique also suggests that in the so called ‘material turn’ in the social sciences , social relations between things are being used as a model for physical relations between people, and vice versa. As a result agency is attributed to technology and/or the environment while human subjects are treated as if they were nothing but the bearers or supports of structural processes they can neither understand or control. This view underpins a hysterical disavowal of the capacity of groups and organisations to intervene in their own functioning , to transform their own conditions of existence. Hysterical Materialists think and act as if there was a fixed one- to- one correspondence between map and territory , ( the so called cartographic pact) and call this ‘reality’, whereas the correspondence is imaginary and subject to a wide variety of articulations. Rethinking the Youth Question Cohen’s ground breaking analysis of youth cultures in the 1960’s and 70’s sought to redefine the field of youth studies , away from an empirical investigation of young people’s values , attitudes and behaviour and towards a critical perspective of how ‘youth’ was being ideologically constructed as a unitary social category , what young people were being made to represent in policy and media discourses and then how that was challenged or reproduced in their own cultural practices. Coming of age stories Cohen’s recent work has focussed on the narrative grammars through which life stories are constructed , and the generational shifts in way ‘youth’ is both imagined and remembered as a formative stage. This study includes an analysis of young adult fiction and contemporary films , as well as written memoirs and oral testimony, gay coming out stories and how life transitions are managed in contemporary faith communities . Attachment to place From the outset Cohen’s ethnographic work has been grounded in the specificities of place , as an anchorage of symbolic or moral claims over public amenity and resource as well as a locus of collective identity and belonging. In early work he contrasted rules and rituals of territoriality with protocols of public propriety as two complimentary forms of civic stake holding. In more recent work this model has been refined , drawing on the ideas of Michael Balint and Jay Appleton to outline a psychosocial geography of place attachment , linked to two contrasting modalities of spatial object relations and mental mapping , prospect and refuge, which are in turn associated with the reproduction of bridging and bonding capital respectively. Memory Politics Cohen’s interest in this field originated with the publication of his memoir , Reading Room Only , in 2013 and has been focused on the forms of public commemoration which the Left mobilises and how this relates to the dominant apparatus of fame. 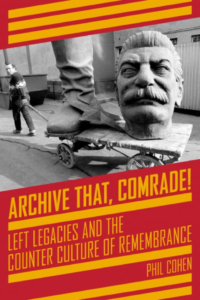 In Archive that, Comrade, he develops a model of archival genres and explores the forms of organisation that might be appropriate for the ‘anarchive’ that sets out to challenge or disrupt dominant knowledge power relations. The commemorations of the 50th anniversary of May 1968 provided an occasion for a further reflection of on the nature of political legacy and the organisation of a conference focused around that theme. There goes the labourhood One of Cohen’s major pre-occupations is the impact of de-industrialisation on working class community in Britain, especially on its cultures of masculinity and manual labour. His approach to labour history focuses on the split representation of the labouring body into promethean and abject images , and how this in turn positions communities of labour as either backbones of the nation or a race apart. He argues that these fundamental binaries can either cut across or reinforce more familiar distinctions of occupational skill and moral status. In some of his research he has traced the evolution of these representations within specific social groups especially those who perform ‘elemental’ labour : miners, tunnellers, sweeps, mariners, foundry workers and roustabouts. Unconscious Racism and its Other Scene: Starting from a critique of reductive psychologies of racism, which reduce it to patterns of prejudice , or individual pathology. Cohen looked for the social structures and cultural norms through which the ‘narcissism of minor difference’ (Freud) might become racialised. He found these in the autochthonies which feature in myths of origin operating in discourses of nation, people , and race. It through these ‘perversions of inheritance’ that the racist imagination gains its purchase on the real and becomes common sense. If the Unconscious is the Discourse of the Other (Lacan) Unconscious Racism is the discourse of the Other’s discourse of the Other. It follows that rationalist pedagogies favoured by anti-racists are doomed to failure since they fail to engage with the structures of disavowal which are intrinsic to racialised structures of feeling and belief. In a series of articles for the journal Soundings Cohen argued for abandoning the classic Marxist analysis of class consciousness based on the distinction between class in and for itself, and replacing it with the notion of class from and to itself, mediated by identity formations centred on multitude or tribe. Theses imagined communities of citizens have become important actors outside and sometimes against the formal apparatus of political representation, posing a direct challenge to Social Democracy. The rise of communitarianism and populism is analysed from this standpoint and a political actor network theory proposed as a way of mapping this more fluid space of ideological affiliations and affinities. Over a forty year period some twenty projects have been carried out in different parts of East London , including the Isle of Dogs, Whitechapel, The Royal Docks, Stratford and Barking. The projects varied in scope and scale from a major comparative research project funded by the ESRC, to small scale community initiatives, and including local school and neighbourhood based ethnographies as well as photography, video and other visual arts projects. Although not a longitudinal study in the strict sense, this long series of projects and related publications has captured the impact of complex structural change on the livelihoods, life styles and life stories of successive generations of young East Enders and their parents . The empirical focus has been on processes de-industrialisation, globalisation and the advent of neoliberal policies in the local housing and labour markets. Much of this work was brought together in the first part of Cohen’s book about the impact of the 2012 Olympics on East London. Intellectuals, dialogic research and the Dissident Academy. Cohen’s intellectual and political formation took place outside the Academy , he does not have a first degree (he dropped out of Cambridge) and he obtained a PhD by publication. He spent five years in the British Museum Reading Room following a course of independent study , and observing how some of his early ideas were taken up by academics and exploited for their own career advancement. As a result he has always been opposed to extractive forms of social research , and suspicious of the ways in which Academics make intellectual capital out of the information supplied to them . Instead he has experimented with alternative, non academic ways of co-producing and disseminating research knowledge through exhibitions, films, comics and the visual arts. He has written on the curriculum of the Multicultural University , the historical relationship between Black and Jewish intellectuals, the limits and conditions of dialogic /participatory research , citizen social science and the critical pedagogy of anti-racism. The extent to which it is possible to sustain a culture of critical enquiry and dissent within the neo-liberal university, and in the face of toxic forms of student identity politics is considered in a further series of studies.